Some European OEM's may scoff at the thought of producing just 45 GT3 homologated cars over the 5 year racing life span of a car but thats just what Aston Martin Racing will do this year as the morph from one iteration of the Vantage chassis to the new. 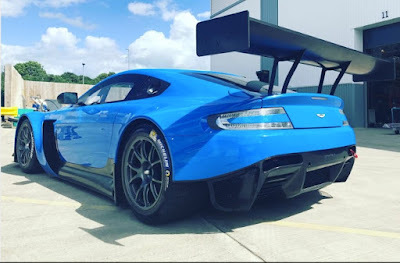 Having read some articles where some German GT3 manufacturer have sold a greater number of their own platforms in just half a season, few can claim that the original chassis concept and design has remained competitive throughout its life like the AMR V12 Vantage GT3 which has remained fully race competitive since its reveal in late 2011. We have learned that the AMR factory will be looking to cease production of the current specification GT3 Vantage at the chassis number 45, a number that should be attained by the end of the summer. Two such new chassis have already been completed and shipped to the Australasia racing environment (which have been specifically asked not to divulge to where or whom) with a further two due to be shipped to AF Racing in Europe in the coming weeks. We then understand that the 2/3 balance to that illusive 45 car figure will then be made up of GT3 'specials' before total Prodrive factory emphasis is placed upon the new variant of Vantage racer. Prior to Le Mans we learned that the new AMR GTE platform is well under construction within the factory with its roll cage being fabricated and fitted alongside a power plant that much resembled a V8 block with spinney things attached!! Our guess is that is should be out testing by the end of the summer/early autumn.